Oh, the places you can go when you visit Ontario. One of Canada's 13 provinces and territories, Ontario is home to more than a third of all Canadians as well as the financial capital of Toronto and the national capital, Ottawa. Ontario is much more than just a hub of activity for stock brokers and politicians though. This sumptuous slice of Canada features a diverse range of geography that includes thousands of protected lakes and forests, charming small towns, historical sites, and bustling, multicultural centers. Canada's second largest province after ​Quebec, Ontario is about the size of California, Nevada, and Arizona combined. Its population is highly centralized in the "Golden Horseshoe" region, which wraps around the western end of Lake Ontario. This region is especially popular for visitors as it features the handy one-two attraction whammy that is Niagara Falls and Toronto, a mere 1.5-hour drive apart. Once you head north of the Golden Horseshoe, the population thins drastically, with the northern region, comprising about half of Ontario, being essentially uninhabited. When you plan your Ontario travel itinerary, don't forget the size of Ontario and how you'll be getting from place to place. Traversing the entire province takes more than 24 hours and roads can be mighty rugged in spots, not to mention what it's like to get around in winter. In many ways, Canada's capital city, Ottawa, is like the country itself and the people that live there: not too flashy, a bit reserved, but storied and cultured. Located in the northeast part of central Ontario, about a five-hour drive from Toronto (but only two from Montreal, Quebec), Ottawa is a bit detached from the more populous Southern Ontario region. The rewards for making the effort to visit this part of the province though are ample. The striking and austere Gothic revival architecture of the Parliament buildings and the Chateau Laurier swaddle Ottawa in history and formality, but a well laid out city plan that is human in scale and pedestrian-friendly brings the city down to earth. Many of the best things to do in Ottawa are affordable or even free. A tour of parliament, skate down the famous Rideau Canal, or wander around Byward Market are just some of the low-cost options in Ottawa. The city is brimming with interesting museums and galleries, such as the National Gallery of Canada, Aviation & Space Museum, and the Royal Canadian Mint. Head just outside city borders and you have miles and miles of Gatineau parkland in which to hike, camp or just breathe fresh air. Niagara Falls is particularly impressive given it is plopped in the middle of Canada's most densely populated region in Southern Ontario and not in some deep, remote brush or canyon. An easy 1.5-hour drive from Toronto and 30 minutes from Buffalo, "Niagara Falls" is both the Ontario city and what the three waterfalls (two on the U.S. side and one on the Canadian side) have come to be known as collectively. The largest waterfall, bow-shaped Horseshoe Falls, is Canada's contribution to the aquatic trio; millions of visitors a year arrive to not only view the might and wonder of the falls but partake in the hustle and bustle of the whole city, which is chock full of tourist attractions, hotels, and restaurants. Congested, bustling and multicultural, Toronto is a constant buzz of excitement featuring heaps of big-city attractions like shopping malls, theaters, museums, and more. Set along the shores of Lake Ontario, Toronto is a city rich in Canadian heritage but has grown to include diverse, ethnic regions that thrive in the heart of the city. The contrasting patchwork of neighborhoods, from Little Italy to Greektown to the funky and eclectic Kensington Market, is one of Toronto's most compelling traits. 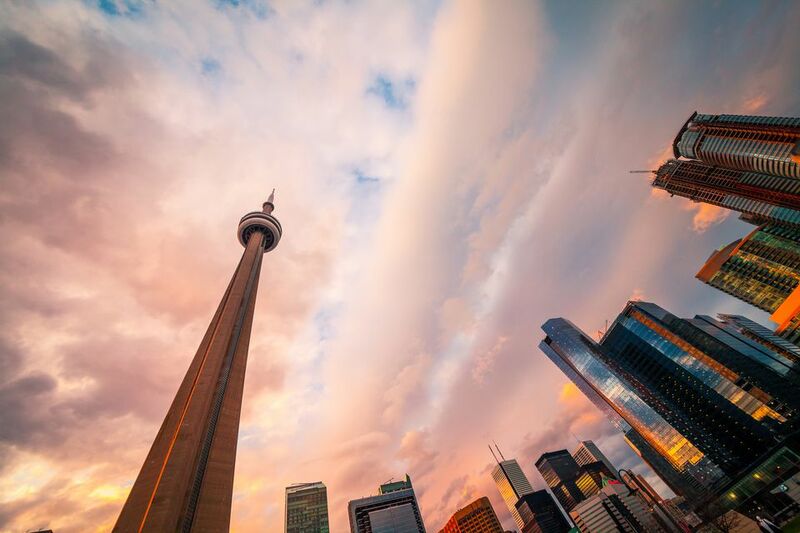 Toronto's splashy, big-ticket attractions include the CN Tower, the Eaton Centre, Ripley's Aquarium, the Royal Ontario Museum, and Canada's Wonderland. If you're planning to visit a few attractions, consider getting a Toronto City Pass, which gets you half-price admission and VIP entry. Wine tasting is more than just the consumption of the delicious nectar; it is the whole experience of moving from winery to winery in a divine setting, chatting to friendly, informed sommeliers and coming away with not just some fine vintages, but a fuller appreciation and love of the region. So, what better way to get to know Ontario than by drinking its wine? Ontario has several wine growing regions, the most prominent being the Niagara Region, a mere grape toss away from the brash and bustle of Niagara Falls. Sitting at roughly the same latitude as the illustrious wine growing regions like Languedoc and Provence in France, the Niagara region grows many of the same grape varietals with great success. In addition to traditional wines, such as pinot noir and Riesling, Niagara is famous for its sweeter ice wines and late harvest wines that are made from grapes that have frozen on the vine. Besides the Niagara Region, Prince Edward County - halfway between Toronto and Montreal - and Pelee Island, on Lake Erie, produce enough wine that tourist industries have sprouted up around them, making both delicious little getaways. Ontario is a province full of natural beauty with lots of opportunities to take it all in on foot. Though the elevation never gets too high like the famously mountainous western Canada, Ontario's landscape features thousands of lakes, rocky or sandy shorelines, rugged cliffs, meadows, ancient forests, and more. Even urban centers offer hiking opportunities because nature is never far away. Some of the more famous hikes in Ontario include along the Bruce Trail, Canada's oldest and longest marked footpath, and the Waterfront Trail, which stretches along Lake Ontario connecting cities and communities. Government initiatives, like the national and provincial park programs, govern a massive network of trails ensuring they are clear and well marked. Camping is one of the most popular summer activities in Ontario and even in metropolitan Toronto, a campground is never far away. Some of the most acclaimed camping awaits in the northern parts of the province, where urban sprawl gives way to the rugged, forested landscape of the Canadian Shield. There are well beyond 300 national and provincial parks in Ontario, many of which maintain campsites that are open to the public. Some of the most popular include Algonquin and Killarney provincial parks. An easy online booking system lets you reserve a campsite up to five months ahead of time. Popular campsites go quickly, but you can always check online for last minute bookings or just show up. Ontario Parks is keen for everyone to develop a love of camping and offers a Learn to Camp program in which newbies can participate in a guided overnight camping experience. Further making camping in Ontario easy and accessible is Parkbus, an express bus service connecting major cities to campgrounds, canoe access points, lodges, and hiking trails. Ontario is home to a cultured group of people and just about any one of its cities will have live theatre on the roster of things to do, including Toronto, which is almost on par with New York City and London for its first-rate theatre productions. Even more distinct though are two relatively small-town festivals that are a big deal to not just locals but theatergoers around the world, the Shaw Festival and the Stratford Festival. The Shaw Festival stages productions by Bernard Shaw and his contemporaries from April through December in the picturesque town of Niagara-on-the-Lake. The Stratford Festival features the best works of theatre in the classical and contemporary repertoire, with special emphasis on the works of William Shakespeare, in the town of Stratford. In both cases, the towns are as compelling as the theatrical productions, full of artsy shops, boutiques, and restaurants in delightful waterside locations. Dotted across the province is a wide range of resorts, from basic to swanky, that lets visitors immerse themselves in Ontario's great outdoors without having to pitch a tent. Many of these resorts are close to water, ski hills, golf clubs, and hiking/mountain biking trails and open year-round, offering seasonal fun and distractions. Some resorts will have separate cabins on site, possibly with kitchens, for more private accommodation. Guest rooms may also be located within a main or adjacent lodge. All guests have access to the resort's activities and amenities, which generally include pools, ping pong or pool tables, games, boats, ​snowshoes and more. Some of Ontario's most popular resorts include Deerhurst in the exclusive Muskoka district, famous for its wealthy cottage owners and bountiful small lakes, Elmhirst, farther east and closer to Toronto and Blue Mountain, most well known as the province's best ski destination. Toronto and Niagara Falls are Ontario's biggest attractions for their brash and splash but you won't regret putting smaller towns on your travel itinerary. Ontario's most charming small towns convey unique aspects of the country's history and character, giving visitors to the region a fuller Canadian experience. They also have more intimate accommodation, often in scenic and historic buildings, such as the Millcroft Inn, a former grain mill in the rolling hills of Caledon, or the Prince of Wales, a vintage hotel in Niagara-on-the-Lake. Elora, for example, is situated alongside the rushing Grand River and perched above the Elora Gorge; it features beautiful stonework dating to the 1800's and many of the original buildings have been transformed into boutiques and restaurants. Dundas, is a delightful village set in a deep valley, a geographic positioning that has saved it from the urban sprawl afflicting so many other towns. Its main drag is well worth a wander for its galleries, shops, and local fare. Ontario is a big province, about twice the size of France. If you are in Toronto and want to drive west to the next province (Manitoba), prepare yourself for about 24 hours in the car. Getting to the northern part of Ontario is time-consuming but the rewards are many. As you move farther from the commerce and commotion of Toronto, notice how the population thins and the pace of life slows. Some exciting cities for sure, but unique adventures that are more about finding peace in nature and less about seeing and buying stuff are what make Northern Ontario such a compelling destination.